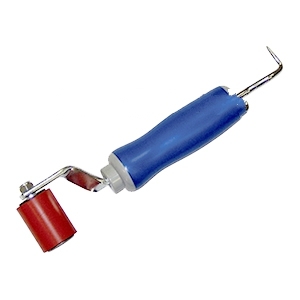 PRODUCT: Everhard Silicone Seam Roller, 1-3/4 inch wide x 1-7/16 inch diameter, single fork, with ergo cushion-grip comfort handle and steel seam probe, ball-bearing professional grade. Price/Each. Roll-N-Chek™ has a built-in seam tester that lets you quickly and easily check seams right after seaming. Proven products in the roofing industry. Designed for roofers doing membrane welding. Non-stick and heat-resistant, specially designed for tough roofing work. Includes smooth-running enclosed bearings and comfortable hard-wood handle.